The trip home from Wellington following the New Zealand vs Fiji football match (thanks Crombie Lockwood for hosting!) turned out to take rather longer than expected. Having arisen at 6.15am so as to get breakfast before the 8.15am flight to Auckland, we were a little alarmed to have the flight take off-time changed to 10.45am whilst we were at the airport. Then flights started getting cancelled, the fog moved in and so we decided to get a rental car and flights out of Palmerston North in case our flight was cancelled. Just as well we did as about half an hour later, the Wellington Airport was closed for the day. The rental car was not ready until midday so we spent more time with the Super Women. Finally, we set off for the drive to Palmerston North at about 12.30pm, confident in the knowledge we would get there before out flight was due to leave at… wait for it… 8.35pm. 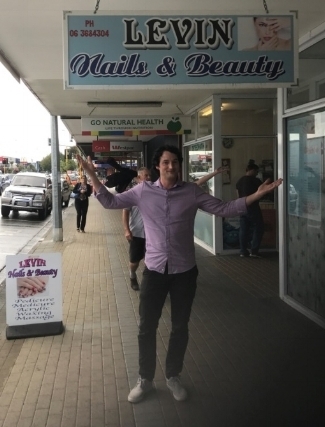 A highlight of our road trip was a stop for Brad in Levin – see photo below. After having spent a happy 4 or so hours at Palmerston North Airport, and a number of planes leaving Palmerston North late, we were somewhat alarmed to see that our flight departure time had changed from 8.35pm to 9.50pm - see attached text announcement. This meant that our flight was going to get cancelled… But before it did we tried to get a rental – none until Friday (it was Wednesday). Wish we had kept that first rental! And then there was no accommodation in Palmerston North (or Bulls or Marton either for that matter…). Upon checking flight availability, the next flight that we could get on out of Palmerston North left at 8.35pm on Thursday. Which is when I spoke to a taxi driver. “Will you take us to Auckland?” “Yes” “How much?” “I’ll just check”. 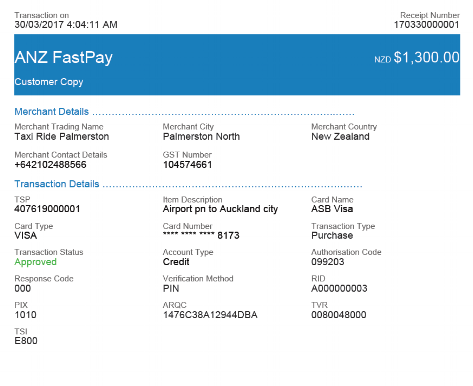 Apparently it is $1,565 from Palmerston North Airport to Auckland Airport. I said I lived about 30 minutes past the airport but would he do it for a set fee? Again, a very positive “yes”. So with our ride organised, our taxi driver went home to get some clothes leaving us to have a couple of beers in a very salubrious establishment – see photo below. And at 9.00pm on Wednesday night we set off. I eventually got home at 4.05am on Thursday morning – see receipt below. So a “not so excellent adventure” really, although a Palmerston North taxi driver is my friend for life!